The artwork Rayhan/Jir exists in three forms. 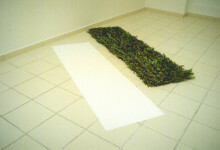 The first version, Rayhan/Ramad, is composed of two rectangles, one made of myrtle and the other of ashes, installed parallel to one another on the ground. The second version, Rayhan/Jir, is made with a rectangle of myrtle and one of lime, positioned in the same way. As for the third version, entitled Jir-Ramad, it is comprised of a rectangle of chalk and one of ash. Each of these works was presented in different places: Rayhan/Ramad in Spain at the Palau Center for Art, Rayhan/Jir in Tangier at the Galerie Delacroix, and Jir/Ramad in Turnhout in Belgium at De Warande.